Inventive technology comes to everyday cleaning with Pura Naturals plant-based sponges. The sponge’s highly absorbent foam attracts cooking grease and oils while its scrubbing pad gets a boost of abrasive power from walnut shells. The non-toxic foam was invented for a project far bigger than any mess you’ll ever have at home—the 2011 Gulf Oil spill. When the foam proved safe and effective in absorbing oil while repelling water, the EPA approved it for use in all American waterways. These bacteria resistant sponges get surfaces grime free and are made to last. Typical home cleaning solutions won’t break them down, and Pura Naturals backs every sponge with a 30-day stay fresh promise. Durable, Made in the USA, and eco-friendly, these mini engineering marvels can handle cleaning projects big and small. Hi everyone! I'm Jim Kordenbrock, the founder of Pura Naturals. I want to create earth-conscious™ products that will not harm people or our planet. We will start with a household sponge that performs better, won’t smell, is made from plant-based, renewable resources and is Made in the USA. I’m in sunny Southern California and I’d be happy to answer any questions about our cutting edge sponges. Hi there, Dig the idea very much! Curious. I have for a long time now cut down the regular sponges one buys in the store into 3-4 "mini" sponges. Simply, is cost effective to me, a whole sponge won't get "nasty" and really, the smaller size is just better. How do/will these hold up to such? Great idea! In fact, when we send out samples, we cut them into smaller sponges. So yes, they will hold up. And the great thing is our sponges will not generate that typical nasty, "bad sponge smell" that you referred to! Enjoy! @Jim I would love to try these out, but would hate to spend the money only to find they don't work. I have a stove that could really use something like this if it works. You say "when we send out samples", is it possible to get a samble? Love the sponges! I use them for kitchen clean up at the Marriott hotel I work for and as gifts to my guests to make them feel special. The product is wonderful and guest love them. Hi - Are these cellulose sponge? How are they anti-bacterial? Do they contain triclosan? @Elizabeth C. These are not cellulose; they are a proprietary product. There's a better description on their website, but these aren't your traditional sponges. They absorb oils and grease but will not absorb water. Since they don't hold water, bacteria don't grow. The foam is not cellulose and it does not contain triclosan. In fact, we do not use any glues, adhesives or toxins in our sponge- the Walnut scrubber naturally adheres to the sponge during our handmade manufacturing process! Our sponges are hydrophobic so they repel water, providing no breeding ground for bacteria. In fact, you will be amazed at how long you can use them without generating a bad odor. We guarantee our sponges NOT to smell or we will buy them back! You wrote that: "They absorb oils and grease but will not absorb water." This may be a silly question, but then I wonder, how do they soak up water if one is using the sponge to clean up a spill? Judy, While the sponge is hydrophobic, it is not 100% hydrophobic so it will pick up a slight amount of water. The primary purpose of our sponge is to absorb oil, grease and grime....it does an amazing job of cleaning...thank you! I run the sponges I use now through the dishwasher to sanitize them. Can I do this with the Pura Naturals sponges? If not then how do I sanitize them? Lisa, Yes you can but we recommend you do not because you don't have to! If you rinse them out, they will not generate a bad odor. I also addressed this in the previous post. Thank you. Lisa, I had the same question but seem to be having trouble asking James. Guess I'm still computer-challenged! Somewhere I read that putting the common kitchen sponges in a microwave for one minute will kill the bacteria, etc., and get rid of the smell. I think that might kill the natural elements in these Pura sponges, but I'd love to have sponges that don't STINK within a couple of weeks of their first use no matter how hard I squeeze them dry after each use and "wash" them with dish soap. James, do these ever smell, and what do we do to "treat" them? Thanks! Elizabeth, We recommend you do not microwave our sponges. There is no need to! Just rinse it out after each use. I have a sponge that I have been personally using for over 7 months and it doesn't smell (and I have never put it in a dishwasher and microwave)! Thank you. @Jim hi Jim, just wondering why the description of the sponges says it comes with six sponges & then it says "a six month supply." If you have been using one for seven months it must be possible to keep them longer than a month each, correct? Also, which type sponge were you talking about with or without soap? Thank you, these sound great! Lee, That is a great point and you are correct- they will last longer. It does depend on your usage so the challenge is we don't want to over promise, especially if you are using it for something unusual. Our goal is to get the sponges in your hands to try and let you decide how long they last based on your usage. The soap will not last 7 months- 30 days is the longest we have seen; the sponge itself will keep on going! Thank you! Can this sponge be cleaned in the dishwasher? Joan, yes but you don't need to. See the previous post. Also, if you purchase the soap-infused sponges, we don't recommend you put them in the dishwasher due to the soap. Thank you! 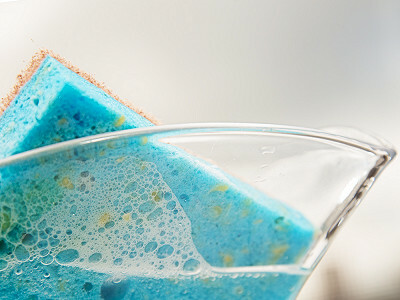 @Jim Joan, if you get the sponge infused with soap, I would be careful about putting it in the dishwasher, as dishwashers don't go with most dishwashing detergents - lots and lots and lots and lots of bubbles - maybe even more than that! Great concept. For the soap-infused sponges, how long will the soap last--for the duration of the month the sponge is recommended to be used for? That seems like a long time to retain the detergent. Thanks. Rick, The majority of our users will get a month of uses out of the soap sponge. That said, it also depends on how many dishes you wash, how frequently, how hard your water is, etc. One of our employees has 7 kids so they will only get a week out of the soap sponge! Are these safe for nonstick cookware? Nancy, yes, our walnut scrubber is safe for nonstick cookware. Thank you. Please, please, please make me an eco-friendly kitchen floor mop that won't fall apart within three months (Casa Bella, I'm talking about you people). I'll even beta test it for ya! In the meantime, I'm buying your household sponges. Jennifer, Great idea! In fact, we have multiple products we are considering. Our mantra is to "be better" with all of our earth-conscious products- in other words, we want to make products that are better than what is currently available! Thank you. Susan, You bring up several great points. First, the sponge itself will last a long time. The soap will eventually wear out but the sponge will keep going and it won't smell bad! I have a sample that I have personally used for over 7 months now. I know, it sounds crazy. Our sponge is not recyclable but the soap is biodegradable. There are multiple uses for the sponge after it is "done." For instance, you can transition the sponge to a bathroom/household cleaning sponge; it is great at cleaning glass and ceramic tile; You can cut it up and use it in the base of planters for aeration. We also use all of our sponge material for other products so we don't waste any material. If our sponge is inadvertently sent to the landfill, it is non-toxic and will not harm the environment. When you wet the soap sponge, it will lather nicely. Again, no need to put the sponge in a dishwasher or washing machine. Thank you. @Jim Thanks Jim --- I'm sending in my order now! @Jim How would this be cleaning up at a campsite? Is the soap biodegradable? Daniel, These are great for camping! And yes, our soap is all natural and biodegradable! We have a lot of our employees who use this sponge for camping- it is so convenient! Thank you! @Jim Can the sponge be composted? Thanks! Michele, several folks have used our sponges for composting- they are great for aeration! Thank you. Nancy, our sponge does extremely well on glass. I'm not sure about vintage glassware and sterling. You may want to test it in an inconspicuous area. Thank you! If it absorbs grease, does it ever "leak" out onto your hands/dishes? Carol, we recommend you rinse the sponge under water to wash out the grease and continue using it! Thank you. Love this idea @Jim ! I've used them at home in the kitchen and they are great! Thanks Saleena! We appreciate your support! This may be a silly question, but my son has a nut allergy. Do you know if the scrubber (made from walnut shells) could cause him problems? The allergy isn't severe, but I'd want to know the facts before purchasing what sound like great sponges. Thank you. Christopher, the walnut scrubber is made from walnut shells not the meat of the nut. The supplier who provides these has never had a problem with allergies. Good luck! Thank you. Jim - Is your product available in Canada , and if so where can I get it . Doug, we are currently working on several international opportunities due to a high level of interest. Let us know if you have any contacts in Canada! Thank you! Does the kitchen sponge with scrubber work well on stainless steel? Andrea, yes, our sponge works great on stainless steel. Thanks! Thanks Jim. Is there a website that tells more about your products? Andrea, yes, you can find additional information on The Grommet's web site....they will post a brochure shortly. Thank you! I am curious about the effects of seawater. I am interested in using these on my fishing boats to reduce the chemical residue that may be transmitted to the bait through handling soaps/cleaners and not washing thoroughly. I would bet sea salts would dry this worse than ordinary sponges and therefore require more use of cleaners. If I am wrong and salt water will not be a problem I am already sold. Matt, Unbelievable question! This is how our company started! Our sponges are made with BeBetterFoam which was created to clean up oil spills out of our waterways, to include salt water! The segment in the video above shows how well our sponges absorb oil out of salt water- that aquarium is filled with salt water. Thank you! @Jim That's good enough for me. I will give them a try. Thanks Matt. Let us know what you think! Jim, sounds like a great product. How well does this work on a BBQ grill? Matthew, our sponge cleans grills extremely well. Again, our sponge is oleophilic, which means it likes oil, grease, and grime.....the video shows how well it aborbs these contaminants. It lifts grease and grime like a magnet! Thank you! Just bought two 6 packs when I noticed the shipping was the same $$. I grow weary of the usual cellulose sponge smelling bad in a few days or weeks - that mildew smell really spreads through the kitchen. Those grocery store sponges aren't all that much cheaper and these look way more efficient and earth-friendly. Thank you for a reasonable price point and shipping cost. I wish you great success because I'm certain we'll be buying more. Good luck on future products! Danny, thank you. I think you will be very happy with our sponges, especially the lack of bad odor! One of our customers works for a Marriott Residence Inn and she used the sponge in the actual Marriott kitchen. Our sponge lasted 11 weeks in that industrial setting (versus one week for the typical heavy duty industrial sponge) and it never smelled bad! Let us know what you think! Thank you! What advantage is there to use a sponge that is infused with soap over the normal way of using a sponge that is separate from the soap? Mike, another great question. A few points. First, adding soap makes cleaning very convenient. You don’t have to bend or reach over, put the soap on the sponge, hold the pan, wash, and then repeat. We provide one convenient step that requires only one hand….it is so easy! No one else has been able to duplicate our patent pending soap infusion process. The soap is actually interwoven throughout the sponge. The all-natural, degreasing soap we use is also biodegradable and contains essential oils, coconut oil, jojoba, and Vitamin E to name a few. It cleans well and it is not harmful to you or our planet. Thank you! KL, It is a balance between an effective degreasing soap that cleans well and the ability to moisturize your skin. The good news is that our degreasing soap is all-natural and biodegradable and it contains essential oils, coconut oil, jojoba, and Vitamin E to name a few. It cleans well and it is not harmful to you or our planet. Thank you! Is it possible to purchase these sponges at grocery stores? We live in Rochester, NY and the local store is Wegman's. I really hope to be able to purchase them there soon. thanks. Leanne, Thanks for asking. Wegmans is a great retailer and we would be honored to have our sponges on their shelves! Wegmans yes. Robert Hester, ha, ha. Amy from The Grommet team here. I'm a native Rochesterian and happy to see you here! Getting into Wegmans would be a dream for Jim. The Grommet is based in Boston and we've been lucky enough to get a few Wegmans stores in the last few years. Could the non-soap sponges be used for skimming the fat from the top of stock? Felicity, we would have to better understand the use. Please send an email to the customer service team at The Grommet and they will get in touch with me. Thank you! Thank you for making our launch so successful today. We appreciate all of the wonderful comments and suggestions from everyone. Please continue to provide us feedback on our sponges. We value and need your input in order to continue on our journey of developing innovative and "better" products that will not harm our environment! Stay tuned for more amazing earth-conscious products from Pura Naturals! Thank You for what looks to be a great product and for sparking some useful debate about it's use. Both aspects are commendable! This may be a silly question, but would it be safe to use the plain sponges to soak up grease off of food. Example the grease that forms on top of a pot of stew when using a fatty pot roast? Windy, Not a silly question. The sponge would work great for that application but we have not received any approvals to use our sponges for food products. Thank you. Judy, our unique, patent-pending soap-infusion provides the sponge with a lot of soap "interwoven" throughout the sponge. The soap will last for up to 30 days, depending on how frequently you use the sponge. And yes, you can continue to use the sponge once he soap runs out! Thank you! I have an acrylic bathtub. 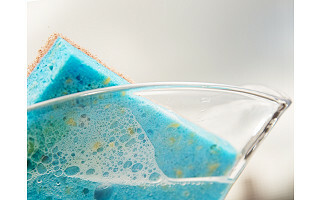 Will your sponge scratch the surface and will the soap reduce its luster? Inventive technology comes to everyday cleaning with Pura Naturals plant-based sponges. The sponge’s highly absorbent foam attracts cooking grease and oils while its scrubbing pad gets a boost of abrasive power from walnut shells. The non-toxic foam was invented for a project far bigger than any mess you’ll ever have at home—the 2011 Gulf Oil spill. When the foam proved safe and effective in absorbing oil while repelling water, the EPA approved it for use in all American waterways. These bacteria resistant sponges get surfaces grime free and are made to last. Typical home cleaning solutions won’t break them down, and Pura Naturals backs every sponge with a 30-day stay fresh promise.